The PT-D600 is ideal for clear and durable workplace labelling up to 24 mm wide. It is perfect for organisation of workspaces, clear identification of equipment, assets and filing, as well as creation of basic instructional or warning notices. The compact and sleek new design ensures that it fits at any office workstation. It has a multitude of great benefits that help make the workplace more efficient and eliminate those little irritations that have staff tearing their hair out. 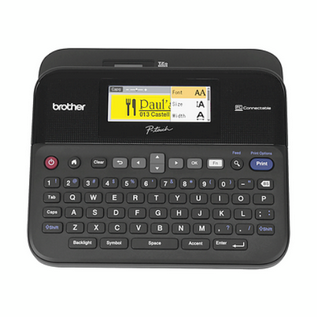 This high specification labeller is the ideal partner in your office to help you and your colleages stay organised. Prints 6, 9, 12, 18 and 24mm, TZe laminated labels.